My daughter is moving across the country this week. It’s exciting for her – graduate school, a road trip with one of her dearest friends, all that stuff. Me – not so much. As happy as I am for her, I will miss having her and her dog at home. My usual response to these situations is ice cream and retail therapy (aka buying stuff I don’t need). This time, I’m doing a little self-help therapy in the studio. We’re headed to a family reunion in a couple of weeks, so I will need some hand-work for the trip. I bought the lime green Aida cloth thinking to cross-stitch space ships and bug-eyed monsters. I have no idea where the project will go from there, but the panels are small enough to include in a larger quilt or as part of a jacket. 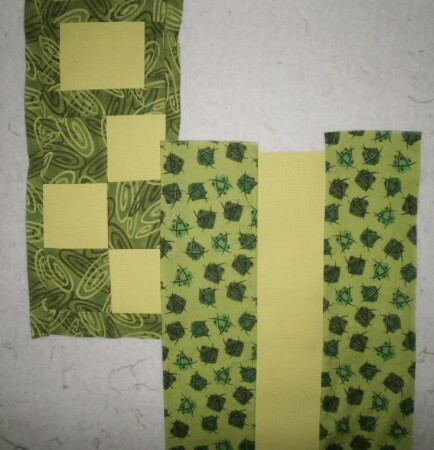 I got this fabric from Carol of Quiltfever, a great quilting blog. The circles looked space-y to her, and I have to agree. I’ve been waiting for the perfect project, but I think using it to help get over being sad about my daughter moving is good. 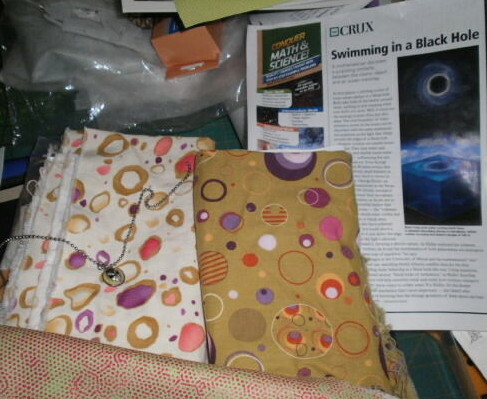 I have an article to inspire space-related fiber art, and an embellishment. 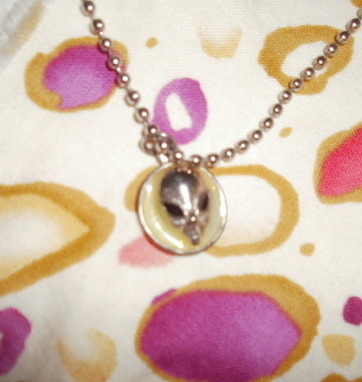 I got this necklace from Free Hippie Bohemian Jewelry on Etsy, with matching earrings. The charms glow in the dark. The last item on my to-do list was to get the supplies for a decompression project. I always need a few days to remember what I do when I return from vacation. The wool applique was made by my friend Lori Vogel. 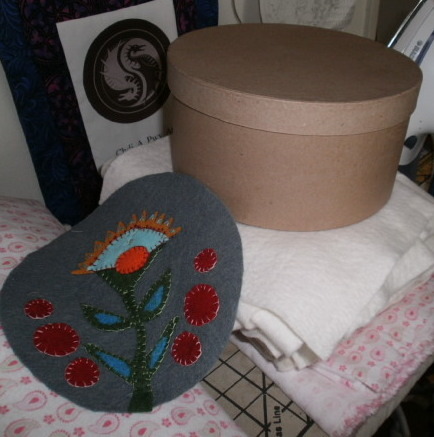 I thought it would make a great lid for a round box, and I have a gray window scarf to use for the rest of the box. The only thing I didn’t have was the box. Of course, I can’t find the fabric at the moment, but I suspect it will turn up in the next week. I’m keeping some of my daughter’s furniture, including a bookcase that my husband has wanted out of the garage for the entire time she’s been here. If I’m not mistaken, I’ll be spending the weekend shifting enough stuff out of the way so my husband can install the case in the studio. Who knows what lost treasures I’ll find?